Program that computes the normal modes of the torsional network model (TNM), an elastic network model whose degrees of freedom are the torsion angles of the protein backbone. These modes displace backbone atoms including C β maintaining their covalent geometry. Versión : 1.0. Uso gratuito para fines educacionales y de investigación. Computes the folding free energy of proteins with known structure. Sequences can be input either through a Multiple Sequence Alignment including the sequence of at least one of the input PDB or through a list of mutations. The folding free energy takes into account the native state as represented in one of the input PDB files, the unfolded state, and the misfolded state (compact conformations dissimilar from the native), modelled as a Random Energy Model (REM) up to the second (REM2) or third (REM3) moment of the contact energy. Versión : 1.0 Uso gratuito para fines educacionales y de investigación. Referencia : Minning J, Porto M, Bastolla U. Proteins. 2013 Jul;81(7):1102-12. Referencia : Pascual-García A, Abia D, Méndez R, Nido GS, Bastolla U. Proteins. 2010 78:181-96. MAMMOTH (Matching Molecular Models Obtained from Theory) es un mátodo de alineamiento estructural de proteínas independiente de su secuencia. Esto permite la comparación de la estructura experimental de una proteína con un modelo arbitrario de baja resolución. También permite la comparación de dos estructuras experimentales, así como la búsqueda de estructuras similares en una base de datos. Referencia : Ortiz AR, Strauss CE, Olmea O (2002) Protein Sci. 11:2606-21. MAMMOTH-mult es una versión de alineamiento múltiple de MAMOTH. Realiza alineamientos múltiples de proteínas proporcionando una superposición 3D, el consecuente alineamiento de secuencia basado en estructura, así como un dendograma para el conjunto de estructuras alineadas. Based on the fixation probability of the Moran process, which depends on the difference of logarithmic fitness and on effective population size. Based on the mean-field stationary distributions computed at the previous point. Instalación Documentación incluida en el paquete. Licencia : Uso gratuito para fines educacionales y de investigación. Referencia : Arenas M, Sánchez-Cobos A, Bastolla U. Mol Biol Evol. 2015 32:2195-207. Descargar : Es necesario registrarse primero. Instalación : Documentación incluida en el paquete. Ejemplos : incluidos en el paquete. Referencia : Arenas, M.; Dos Santos, H.G. ; Posada, D. and Bastolla, U. (2013) Bioinformatics, 29(23):3020-3028. A Scoring Function for Protein-Protein and Protein-Ligand Docking and Molecular Dynamics. Morreale, A.; Gil-Redondo, R.; Ortiz, A.R. 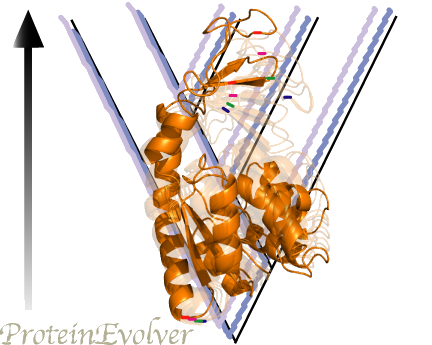 A new implicit solvent model for protein-ligand docking. Proteins 2007 May, 67: 606-16. A graphical user interface to perform structure-based comparative binding energy (COMBINE) analysis on a set of ligand-receptor complexes. Prediction of drug binding affinities by comparative binding energy analysis. Ortiz AR, Pisabarro MT, Gago F, Wade RC. J Med Chem 1995; 38:2681-91. CRDOCK is a protein-ligand docking program similar to Glide, DOCK or Autodock. It uses a hybrid scoring function based on GlideScore(tm) using a molecular mechanics energy function (AMBER-like) and the ChemScore function to score interactions. The docking program is particularly well suited to generate molecular models of ligand-receptor complexes for further use in COMBINE analysis. VSDMIP es una plataforma para el cribado virtural de quimiotecas, integrada en una base de datos relacional MySQL. Licencia : La plataforma se distribuye gratuitamente para uso académico y de investigación, bajo petición a los authores. cGRILL calculates 4 affinity maps: lipophilic (CH3), hydrogen bond acceptor (=O), hydrogen bond donor (NH4+) and mixed hydrogen bond donor-acceptor (OH). It implements AMBER force field van der Waals and electrostatic terms and a custom hydrogen bond. The code is not pretty but it is licensed under GPL v3.